Lame Adventure 241: Goodbye New York Film Festival 2011! The final two films Milton and I saw together at this year’s New York Film Festival were excellent documentaries, Vito and Pina. Vito, directed by Jeffrey Schwarz, is about the late gay rights activist and film historian/critic, Vito Russo. Vito wrote the ultimate history book about gays and lesbians on film, The Celluloid Closet. His book was also made into a fascinating documentary in 1996; required viewing for anyone interested in this aspect of film culture. Schwarz pieces together Vito’s life story with painstakingly researched archival footage intercut with interviews Vito gave and recollections from those that knew him best, his friends and family. Vito’s family, all highly opinionated but clearly very loving Italian Americans were resigned to the reality that Vito was different, but they were also very ahead of their time in accepting him years before Stonewall. This strong family foundation undoubtedly contributed to his confidence as a proud gay man determined to make an impact. Vito knew that being gay was as natural as being straight and he was going to prove it by being honest about who he was. This included his practice of Judyism, his devotion to Judy Garland. His early activism got underway post-Stonewall, during a difficult time when there was deep division in the ranks of gay leadership. Vito was very accepting of all gay people including drag queens and lesbians, an unpopular stand in the early Seventies. Following a gay pride celebration in New York in 1973 where the crowd was particularly unruly, he switched gears and focused on writing and the daunting mission of researching The Celluloid Closet. 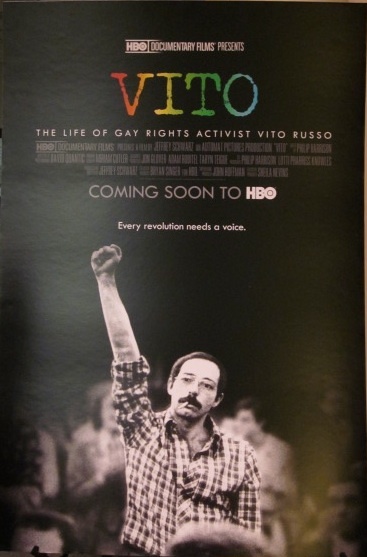 Overall, this poignant documentary is as much about Vito the man as it is also a history lesson about the gay rights movement and how gays and lesbians were depicted on film. During the Q&A Schwarz said that his goal is to have Vito screened in high schools throughout the country so that today’s youth can be educated about gay history. Frankly, I think that everyone young, not so young, gay, straight or undeclared should see this entertaining history lesson about this charismatic force. HBO will screen Vito in June 2012. 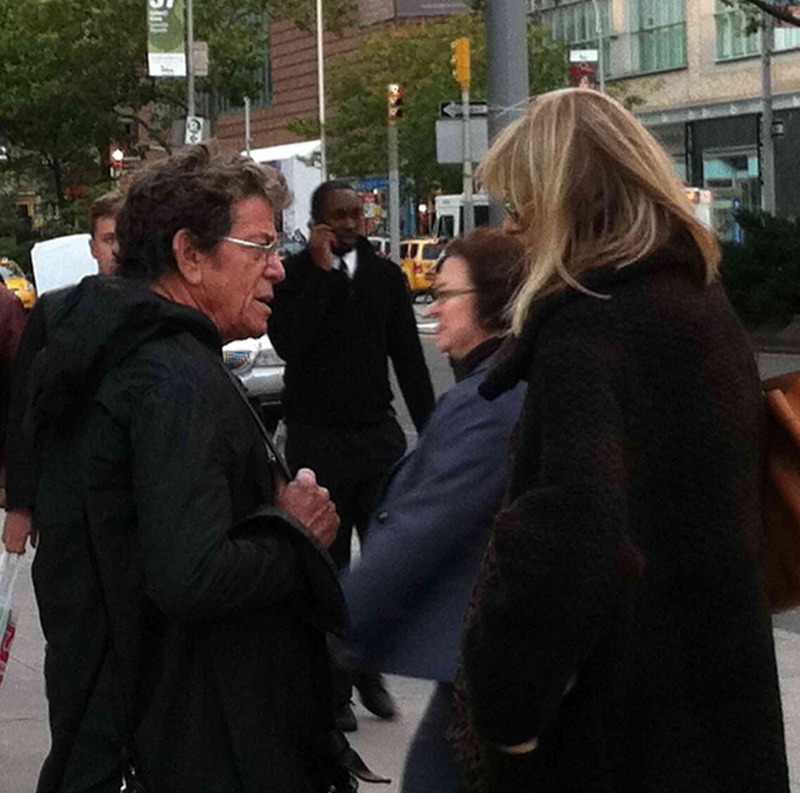 Milton the Paparazzo iPhone shot of Lou Reed standing outside Alice Tully Hall before entering Pina screening. Milton thinks and I agree that the documentary, Pina, about the modern dance choreographer, Pina Bausch, directed by Wim Wenders, is possibly the first film shot in 3D where 3D has enhanced the storytelling. A documentary about dance shot in 3D now seems like a no-brainer, but it took Wenders almost twenty years to figure that out. He and Pina had been discussing collaborating on this venture for decades, but Wenders was reluctant to take on the project because he was unsure how to effectively tackle this subject on film. After he had his epiphany, he organized the film shoot, but tragedy struck; Pina suddenly died. Wenders canceled the shoot. Eventually, he reversed course and decided to proceed with the project. With the participation of Pina’s dance company, he has created a stirring homage to his friend and fellow artist. The dances are intercut with portraits of the dancers staring silently at the camera while they speak their thoughts about her in voiceover. There are not many spoken words in this film, for it is the complex, athletic dances that tell the story about this woman and her unbridled enthusiasm for expressive movement. Personally, I am not much of a fan of dance, but I realized after seeing this film, I am now a big fan of Pina Bausch’s emotionally charged choreography, especially in 3D. Her dancers are men and women of many nationalities and ages; some had to be close to fifty (prompting Milton and I to pop Aleve and swath ourselves with Ben-Gay on the spot). The musical choices, many by Pina, but others by Wenders, also set the tone of each piece. Costumes are as varied as diaphanous shifts and ball gowns for the women to business suits and just trousers for the men. Props and sets include chairs, tree branches, dirt and water. Several of these inventive dances were staged in actual outdoor locations including a glass house, an island near a traffic intersection and a suspension railway’s floating train. This exhilarating tribute to such an inspired artist in the 3D format makes the viewer feel like you’re present with the dancers. Unlike choppy music videos that flit from shot to shot, Wenders editing is generous, showing the entirety of the choreography. The trailer accurately describes this film as being for Pina Bausch by Wim Wenders. Pina opens in New York on December 23rd at the Walter Reade Theater. 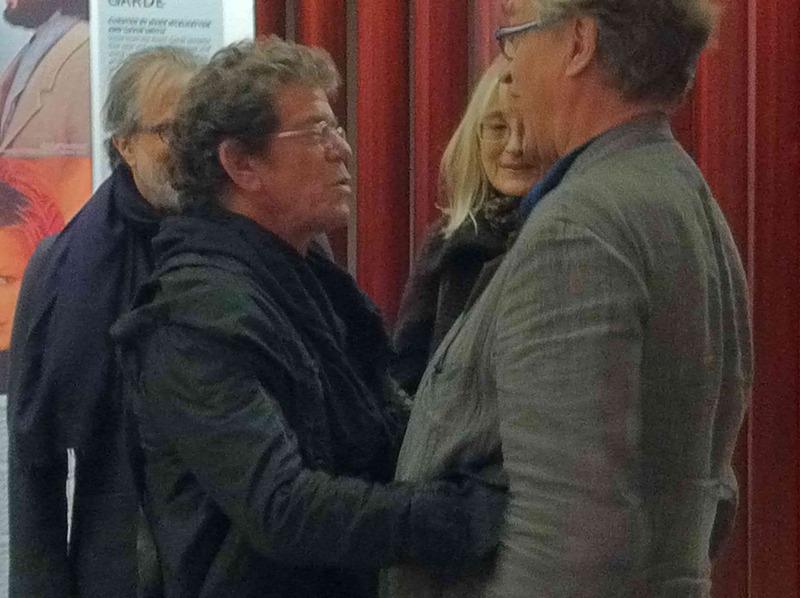 Lou Reed imploring his friend, Wim Wenders, to make Milton the Paparazzo with the iPhone go away.